Alhamdulillah, Praise be to Allah (swt), we as Muslims have a clear purpose in our lives: to earn the pleasure of our Creator. Our, true goal is not “happiness”. Our true goal is to grow nearer to Allah (swt). Many psychology articles about happiness give great ideas and techniques to follow, but few actually talk about Allah (swt). I am so thankful to be a Muslim and to have a goal much greater than being “happy”. I say that the real source of our happiness is having a positive relationship with Allah (swt). We can learn other skills and techniques in order to cope with this challenging world, which support our journey to Allah (swt). Feeling positive feelings helps us to be better Muslims. Positive feelings such as inner peace, joy, gratitude and hope all help us to do more good deeds for the sake of our Creator. Feeling happy is a great thing, but as Muslims, we must never forget our real purpose in life. VERSE 1) Did You Then Think That We Created You in Vain And That You Would Not Be Returned To Us? VERSE 2) And I Created Not The Jinn And Mankind Except That They Should Worship Me (Alone). The purpose of our life is the worship of our Creator in the many ways there are to worship Him (prayer, helping others, seeking knowledge, etc.). VERSE 3) Who Has Created Life And Death So That He May Try You Which Of You Are Best in Deeds. Who will do the best works for the sake of Him? VERSE 4) And We Have Not Created The Heaven And Earth And What is Between Them in Vain. That is The Opinion Of Those Who Disbelieve. And Woe To Such Disbelievers, Because Of The Fire. Shall We Treat Those Who Believe And Do Good Deeds As Those Who Spread Corruption On The Earth? Or Shall We Treat The Pious As Sinners? The believers will not face the same afterlife as the corrupters. The pious will not be treated the same as sinners. VERSE 5) And Among The People There is He Who Sells Himself For The Pleasure Of Allah And Allah is Kind To His Worshippers. The pleasure of Allah should be our goal. VERSE 6) There Has Come To You From God A Light And A Luminous Book, Through Which God, By His Grace, Guides All Who Seek His Good Pleasure On The Path Of Peace, And Brings Them Out Of The Depths Of Darkness into Light And Guides Them Unto A Straight Path. God has guided people to the purpose of life—worshipping Him and seeking His pleasure—by sending His messengers, books and other means. But we have to want to please God to receive this guidance. 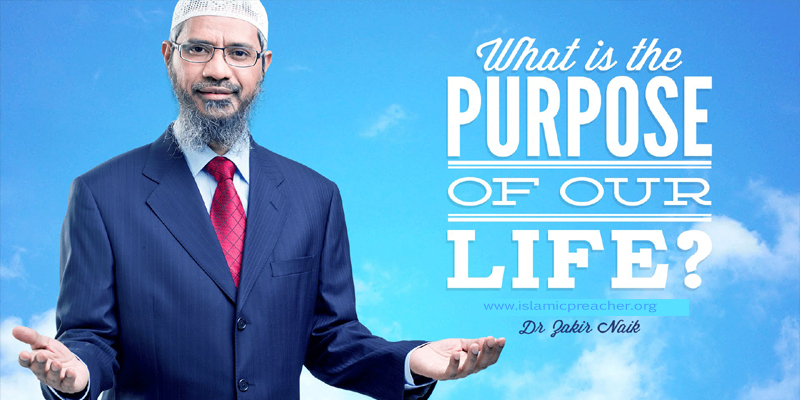 Remember Our Purpose of Life! "We are not here without a purpose. Our existence has a very special and very specific purpose. Something much more than eating, drinking and partying. Something Higher. That is to submit and worship the One Who Created Us and created all the exists around us. To make an active contribution to the society.